Generally we don’t use any physical keyboard and mouse with our tablets. There is a great reason for that. We want to make our computing more portable and don’t want to carry heavy items. And tablets and mobile phones doesn’t need them, as they come with on-screen keyboard and touch-screen. Even, you get option to install different keyboard app. Google has their own Google Keyboard app in Google Play. If you use your tablet for plenty of writing, you know it is not easy to write on a tablet without a keyboard. 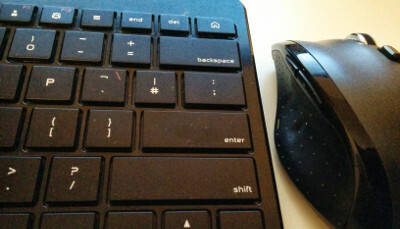 Using a physical keyboard and mouse is easy with any Android tablets. You can write faster using these. Using both of them for your tablet increases your productivity and life becomes easy. Android has built-in support for external keyboard and mouse along with the touch-screen. Writing could be slow and sometimes annoying using the on-screen keyboard. Moving the cursor precisely not even easy. And, more than 40% of the screen covered with the on-screen-keyboard. Using a physical keyboard and mouse be the solution. Either both of them or only Bluetooth wireless keyboard with touch pad. Plenty of them available in Amazon and eBay with a low price tag. I was using a Logitech wireless keyboard and mouse for my PC. My Android tablet has USB host support enabled. So, I wanted to try if it is working. I connected the Logitech USB receiver with my tablet, turned the wireless keyboard and mouse on. Viola, started working instantly and flawlessly. I didn’t have to install any driver or software for that. The tablet was running on Android 4.2.2 Jelly Bean on that time. After I upgraded it to Android 4.4 KitKat, the keyboard and mouse still working fine without any trouble.